On the afternoon of December 28th, German Falun Dafa practitioners held an experience sharing conference at a youth hostel in Wetzlar. 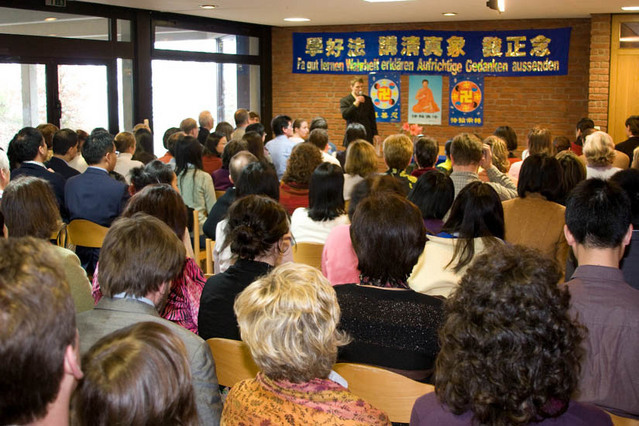 Starting nine years ago, practitioners in Germany have held an experience sharing conference at the end of the year each year. Participants at the conferences have been mostly from Germany and some were from neighboring countries such as Austria and Switzerland. This year, practitioners from Poland and Hungary also attended the conference. The first speaker of the conference was Erika Zhang, who shared her experiences in program production for New Tang Dynasty Television (NTDTV) and preparing the 2007 Chinese New Year Spectacular. As a full-time employee of a company, she spends all her spare time and vacation time producing NTDTV programs and often has to work until midnight. Therefore, when she first heard that NTDTV's Berlin Station was to host the 2007 Chinese New Year Spectacular, she tried to avoid this project, as she knew that it required a lot of additional time and energy. Through Fa study, she realized that she should not fear hardship, and after thorough deliberation she decided to take part in the preparations for the event. In the process of preparation, she not only let go of many of her attachments, but was able to help other teammates achieve better results. Angela Xie lives in western Germany. She talked about her experience in New York City when she helped distribute promotional fliers for the Holiday Wonders show. She realized that distributing fliers also has elements of cultivation. When she overcame her preconceived notions and put on the celestial maiden costume, she found that her fliers became very popular and several reporters came to interview her. Polish practitioner Tomek shared his experience at the Human Rights Forum held in the Polish Parliament several months ago. One of the organizers was very concerned that every speaker at the forum would criticize the human rights situation in China. 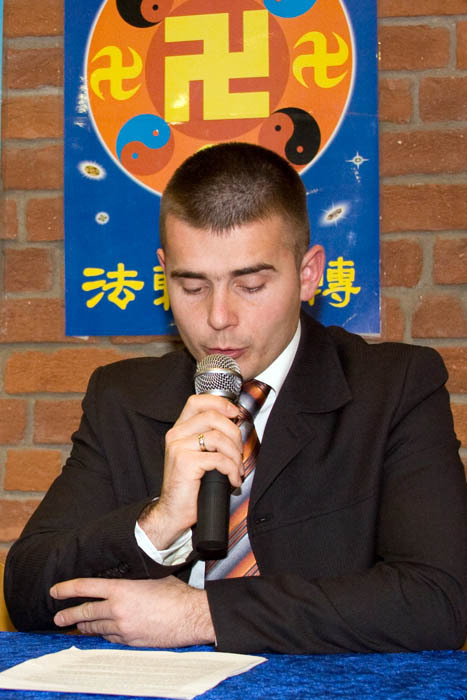 Initially, Tomek was afraid that the organizer would cancel the forum. However, he realized that his notion was not righteous and he continuously sent righteous thoughts during the forum. Due to the Polish practitioners' concerted effort, the forum was very successful and the organizer was no longer worried. He told Tomek, "I didn't know the human rights situation in China was so bad. More people should know about it. We will post all of the speeches on the official Parliament website." Mr. Wang is a chef working in Ruhr. His work starts at 10:30 a.m. and ends by 11:30 p.m. every day. In addition, he cannot participate in most weekend truth-clarifying events because his Chinese restaurant is very busy on the weekend. Given this situation, he decided to call policemen in China who are persecuting Falun Gong practitioners, to clarify the truth to them. When he started this project, he was so nervous that his hands shook. Through diligent Fa study, he overcame many attachments and now he can clarify the truth to Chinese police with confidence and wisdom. Ms. Pan shared her experience in clarifying the truth to Chinese tourists. Ms. Pan was severely persecuted in China and managed to come to Munich in 2004. Her past experience in the persecution and the fact that many practitioners in China are clarifying the truth despite the brutal persecution encouraged her to go to Munich tourist attractions to clarify the truth every day. Ms. Pan, 69, has a rosy complexion and smooth skin. Because she looks so young, tourists cannot believe that she is almost 70 years old. She then tells them that she is so healthy because of Falun Gong. Ms. Pan recorded the statement of the Epoch Times regarding quitting the CCP, and a song encouraging people to quit the CCP, to an MP3 player and played them for Chinese tourists. In addition, she carries a banner which reads, "Heaven Will Destroy the CCP; Quit the CCP for Your Future Safety," so that people can easily read the information. Now and then, Chinese tourists take photos of Ms. Pan with the banner. Over time, she has witnessed people changing. "Initially, many Chinese tourists would curse at me. Now however, most tourists and tour guides are very friendly to me. Upon seeing me, some tour guides call their groups over and say, 'Come and see, and listen.'" Ralf lives near Cologne. Though he doesn't speak Chinese, he found that he could still clarify the truth to Chinese tourists because his presence lets them know that non-Chinese also practice Falun Gong. Ralf often tells Chinese tourists the following in English, "We are all amazed by Chinese culture. 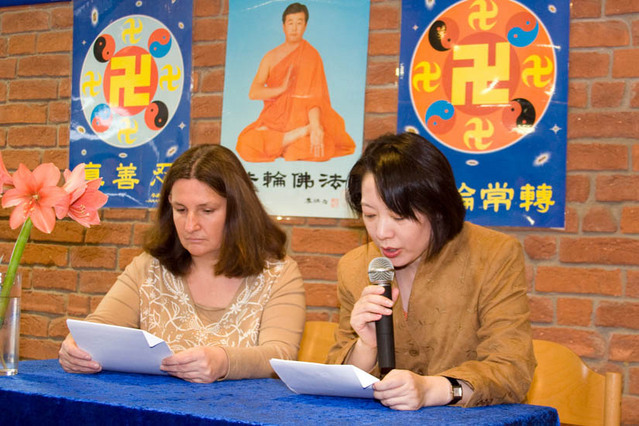 We benefit from Falun Dafa. However, we cannot understand why such a wonderful practice is being persecuted in China. The persecution violates the Constitution of China and the principles of free speech and free will." Ralf also asked Chinese tourists whether they are members of the CCP or its affiliated organizations. If they are, he tells them how to quit the CCP and why it is very important to do so. According to Ralf, many Chinese tourists have quit the CCP and its affiliated organizations in Cologne. Two practitioners shared their cultivation experiences of working with practitioners' media outlets created to clarify the truth to the public. Ms. Ruan said, "I am a researcher, and dealing with business issues is not my strength. Therefore, I had a lot to learn when I started to do marketing for the Epoch Times newspaper. Initially, it was very hard to get advertisements. After so many frustrations, I was feeling desperate and wanted to quit. However, I knew that I cannot choose work based on personal preference and capability. Instead, I should take on any job required by the Fa." Gradually, she came to see a big attachment of hers - the attachment to personal interest. "I always gave my personal issues priority and rarely cared about others' feelings." During the course of working with the Epoch Times, Ms. Ruan had to deal with many people and conflicts became prominent. However, when she saw this attachment and made improvement accordingly, she felt like a huge mountain was removed. Ms. Wang is a professional translator and has many opportunities to meet new clients. Whenever she meet a new person, she thinks about whether this client has Chinese connections and whether the Epoch Times can help him or her to develop Chinese customers. If the new client wants to run an advertisement with the Epoch Times, she helps them design the ad. In addition, she also tries her best to locate potential customers for the Epoch Times. For example, when she sees an advertisement on a bus, she thinks about whether the Epoch Times could run the same ad. Oliver is a German practitioner and knows nothing about the Chinese language. However, he has almost 1,500 Chinese names in his Skype friend list. Two years ago, he started to send truth-clarifying information to Chinese people through the telephone, fax and Skype. Back then he knew little about computers, but now he can use many software programs and has helped many Chinese people to quit the CCP and its affiliated organizations. "The experience sharing conference helped me a lot, especially with how to cooperate with other practitioners. When I was reading the translation of the last speech, I felt that my attachment was melted and my spirit was purified. My heart was filled with hope and confidence," German practitioner Mary said after the conference. Practitioner Ms. Jiang said that German practitioners are in general working very hard in Fa-rectification and their efforts are very admirable. "This experience sharing conference is the best New Year gift for me," said Ms. Du.